18-Oct-01 The Drive Shaft Arrives! Get your sunglasses on! A new polished aluminum drive shaft has just arrived from Inland Empire Driveline and it's too pretty to hide under the car! After visiting Inland Empire's booth at the Nationals this year and seeing the polished 6061-T6 aluminum shafts in person, the decision of what to do for a drive shaft was an easy one. Inland Empire Driveline has been around for over 20 years. Their drive shafts can be found in everything from 100 Point Concourse Cars to NHRA and IHRA Pro-Stock winners. They produce top quality drive shafts at a competitive price. The finish on this piece is simply awesome and after test-sliding it in place, the fit is exact. I won't be installing it for a few weeks until I get the fuel lines run and the exhaust back on. In the meantime I can use it for a mirror. Ordering it was painless. I just filled out a few measurement questions on the back page of their catalog before making the phone call. For the record the differential yoke is a Spicer 3-7/32 -inch and the length from the tip of the transmission output shaft to the centerline of the U-joint at the differential is 40 1/4 -inches. Keep in mind when measuring for a drive shaft the vehicle should be at rest -not jacked up! We've already covered the importance of correct angles so I won't repeat myself but I do have a bit of interesting information to pass along regarding drive shafts used with overdrive transmissions. A quality lightweight drive shaft is very important when you're using an overdrive transmission and here's why. OEM overdrive transmissions typically slow your engine RPM by 30%, so if you can cruise at 2000 RPM in high gear with your TH-350, you'll be cruising at 1400 with a 700R4. Low engine RPM requires increased torque to maintain the same road speed. On top of this, the torque converter locks up and effectively connects the crankshaft to the wheels with no slippage anywhere in the system. This can cause drive shaft vibration at various speeds. These vibrations can happen because the power coming out of the engine is not smooth. Every time a cylinder fires the crankshaft is accelerated. The accelerations are called torsionals and there are 4 of them per crank revolution in a V-8 engine. As engine RPM declines and the required torque goes up, so does the strength of these torsional spikes. Overdrive transmissions reduce the 4 crankshaft pulses to 2.8 pulses per revolution of the transmission output shaft. Meanwhile, the drive shaft is already changing speed twice per revolution because of u-joint angles, making it very sensitive to these lower frequency torsional disturbances. The optimum RPM for smooth running in overdrive seems to be a minimum of 1800 RPM with 2100 to 2300 RPM at 55 to 65 MPH. The longer the converter stays locked up below 1800 RPM the greater the torque-induced vibrations will be. (Think of it as pulling up to a stop sign in a manual transmission car and forgetting to push in the clutch). A precision balanced lightweight drive shaft will play an important part in reducing this undesired vibration, as will making sure our cruising RPM range is within the guidelines mentioned above. Aluminum drive shafts absorb harmonics much better than steel. 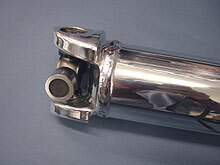 This means that an aluminum drive shaft transmits less road noise and vibration from the tires and axle housing through the drive shaft into the body of the car. 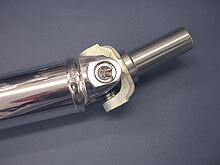 Aluminum shafts also absorb small shocks (like harsh gear shifts) better than steel. A car with an aluminum drive shaft will run smoother than the same car with a steel shaft because it absorbs more external vibrations. Drive train vibrations can literally gobble up horsepower and the rear wheels will never see it, making a precision balanced drive shaft an important performance advantage. There's also a performance advantage in reducing rotating weight. Rotating weight is mass. It's basically what the engine has to accelerate. Race engines are not only measured in power, but also the speed at which they accelerate. The lighter the parts it has to turn to get going, the faster the car will accelerate. That's why rotating weight is always a performance issue. Rotating weight includes anything that turns - not just the parts of the engine itself, but the flywheel, transmission, drive shaft, wheels, and even the tires. With so much time and effort devoted to Project33's engine, it seems illogical settle for less. NOTE: For those who insist on running extremely low RPMs (as is the case with many of the current OEM vehicles) there are other ways to get around the "torsional vibration" problem (like special computer chips) but a lightweight drive shaft is a great place to start. Speaking of lightweight… if you want EXTREME weight savings and the ultimate in vibration absorption (and a lighter wallet to boot ;) Inland Empire makes a carbon fiber composite shaft that's the epitome of cool. Carbon fiber drive shafts are also safer because they shatter on impact with the ground (or floorboard) if a U-joint ever fails. A composite shaft was out of my price range but I'd love to have one. I feel for the money you just can't beat their 6061-T6-aluminum shaft. Oh yeah, there's on more advantage to the drive shaft– now when I put the car back on the ground and the transmission in park it won't roll out of the garage!